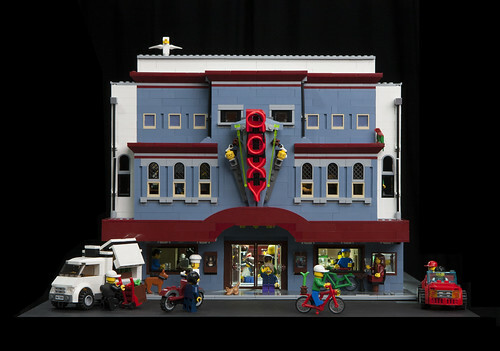 Brick Town Talk: Roxy Movies - LEGO Town, Architecture, Building Tips, Inspiration Ideas, and more! Wellington, New Zealand - (BTT) It's almost hard to believe that going to the movies was once considered a cheap date - the asking price to see grown men pretend to still be in high school and punch people in the face while wearing their pajamas is certainly not what it was. While perhaps not the value they were, there is no denying that few buildings possess the style of a classic cinema. With its neon sign, brightly lit interiors, and grand main theater (which is also handicap accessible), if there was any place worthy of getting a decent chunk of your paycheck, the Roxy is it. Wow, nice to see my MOC on BTT :) I can tell you a little about the piece: LEGO Roxy has been constructed over a 6 month period accumulating 240 hours of build time including the installation of LED Lighting, DVD player and baby Neon Signage. Although the Bricks have never been counted an estimate of the number could possibly be 7-8000 plus (The thought of counting them now scares me!) Most of the LEGO has come from a number of large sets including 3 of the Petshop from the Modular series of buildings which contain the Sand Blue which is a very close match to the Roxy’s frontage. Many other specifically chosen Bricks were purchased via Bricklink an online Brick trading community. The 2 theatres respectively have seating for 56 and 20 LEGO Mini-figures. Populating LEGO Roxy are 60 plus Minifigures some of which remind me of people I work with!